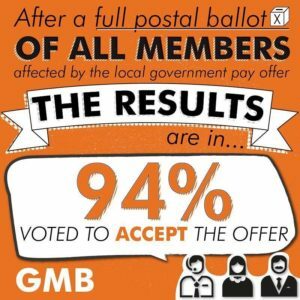 GMB’s full postal ballot of all members in councils, schools and most academies closed on 9th March with 94% of GMB members voting in favour of accepting the offer from the Employers. A meeting will be held between the Joint Trade Unions and the employers next week, following this meeting a further update will be issued. In the meantime we thank you for taking the time to have your say on your pay.